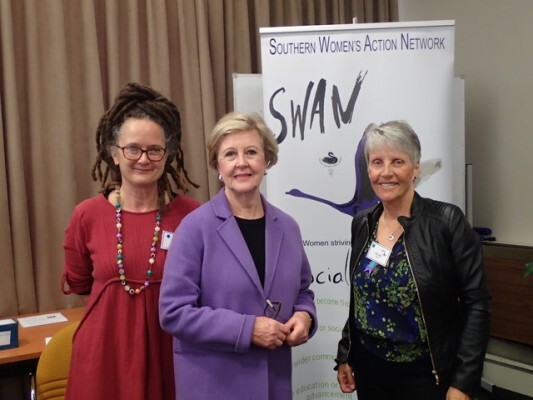 Welcome to the Southern Women's Action Network (SWAN) website. We are a diverse group of women of all generations, who meet in Mornington, Victoria, Australia, for a few hours on a Sunday morning five times a year in March, May, July, September and November. SWAN meetings have an emphasis on 'Social Justice Issues" and provide a forum for matters of concern to women. Our meetings also promote women's active involvement in the community. We share morning tea, listen to an interesting female guest speaker, and have an opportunity to share ideas and information with each other. Membership is informal and new members are always welcome. Please consider coming along to a meeting. Our 2018 AGM was a brief and cheerful event. Thanks to our special guest speaker we had attracted a larger turn out than usual which resulted in a show of hands for volunteers to join the committee! It is both heartening and humbling to see that there are so many women in our community who share similar values around the topic of social justice. This is an exciting time for SWAN as we plan to move forward into the next year, with more events and opportunities to engage the community and a committee boosted with new blood, ideas and enthusiasm. Following our AGM we were delighted to welcome Gillian Triggs as our guest speaker. Gillian enthralled us all with her stories and thoughts, and left us inspired to go out into the world and do our own bit to encourage justice and FairPlay. Many thanks to Gillian for her generosity and inspiration. SWAN is now 21 ! To celebrate this significant achievement we dispensed with our usual format. Instead our November 2017 meeting was a joyful celebration where foundation members and members from over the years shared stories and delicious food. It was wonderful to see so many familiar faces from the past and to catch up with each other again. There was memorabilia to jog memories of all of the wonderful speakers that we have been priviliged to listen to at SWAN. There was also shared laughter when various ex committee members enlightened us about certain organisational 'mishaps'. It was encouraging to hear how things have on the whole improved over the past 21 years. 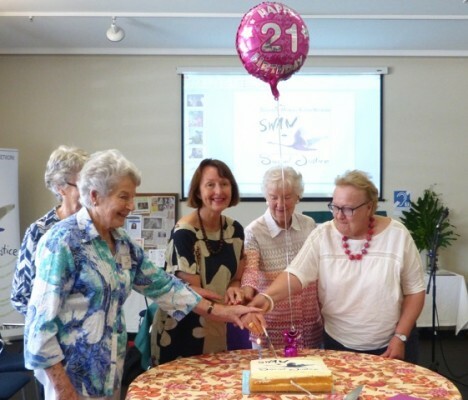 The 21st sparked new enthusiasm for SWAN to continue to inform and highlight matters regarding social justice for women. A personal highlight were the messages from members unable to attend, through these, in fact throughout the whole 21st celebration, ran a common thread of strength and fairness illustrating what is possible when women join together united in a common cause. Heres to SWAN's next 21 years.